When the Metropolitan Opera announced its 2018-19 season several weeks ago, groans were heard throughout the opera-loving world. It had been a long while since anyone had managed to put together such a dull, boring season. Yesterday’s announcement of the coming season at the newly-renovated Staatsoper unter den Linden should have opera-goers everywhere leaping for joy. 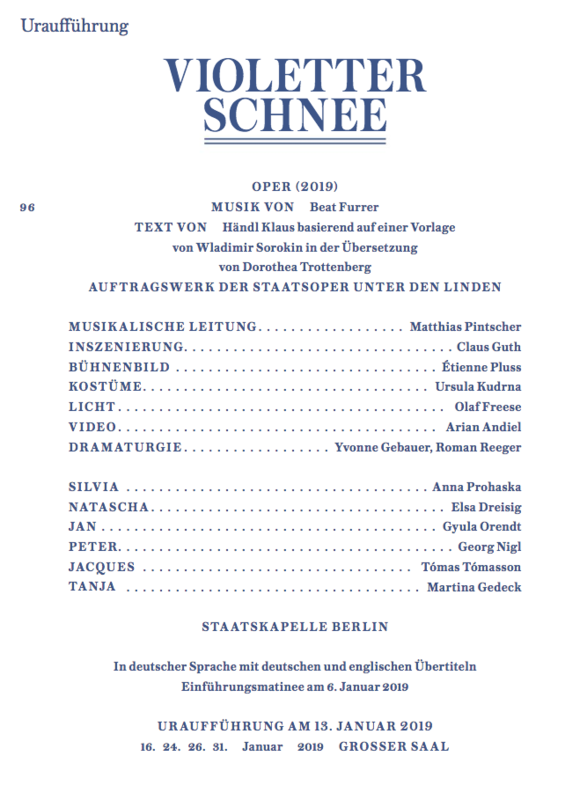 In the first season fully planned by Matthais Schultz, the Lindenoper’s young new Intendant, the company will unveil seven new productions, ranging from Rameau’s “Hippolyte et Aricie” to a world premiere by Austrian composer Beat Furrer, who recently won the prestigious Ernst von Siemens Music Award. For the first time in eons, the company will present Verdi’s complete “trilogia populare,” rounded out by the June premiere of “Rigoletto,” in Barlett Sher’s Las Vegas Rat Pack production from the Met. 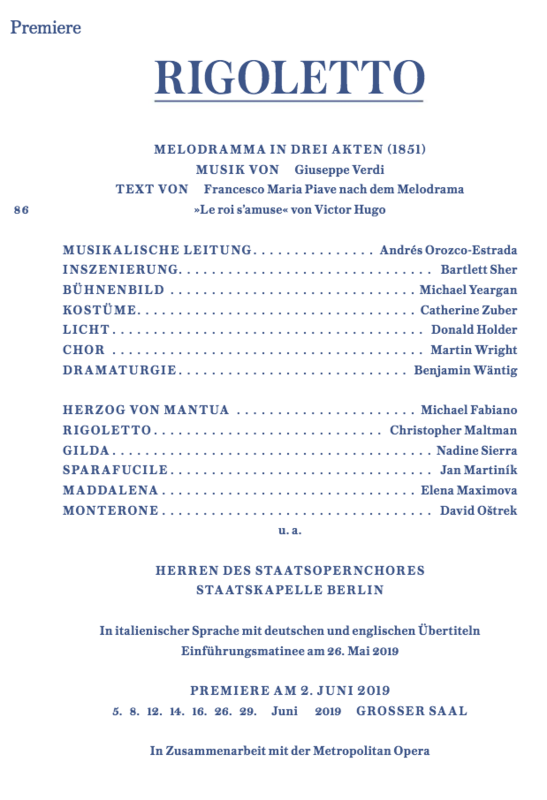 If nothing else, it should at least be more coherent and enjoyable than the Staatsoper’s earlier installments, Philip Stölzl’s bizarre zombies-in-the-madhouse “Trovatore” and Dieter Dorn’s much-reviled, minimal “Traviata” which will be revived earlier in the season. Another thematic highlight is the autumn “Barocktage” (“Baroque Days”) which will feature the Rameau, alongside two full Monteverdi stagings: Sasha Waltz’s celebrated take on “L’Orfeo” and Eva-Maria Höckmayr’s inscrutable “Poppea,” which bowed earlier this season. In addition, the Israeli choreographer leads something called “A Monteverdi Project” as part of the Staatsoper’s new LINDEN 21 project devoted to new operatic formats. Further repertory highlights include Ruth Berghaus’ “Pelléas et Mélisande” with Rolando Villazón and Marianne Crebassa in the tile roles and Claus Guth’s forest-bound “Don Giovanni,” conducted by the 29-year-old wunderkind Lahav Shani, a Barenboim protégé who was recently announced at Zubin Mehta’s successor at the Israel Philharmonic. The 2018/19 season will open on October 7 with Luigi Cherubini’s “Médée”with the Bulgarian star soprano Sonya Yoncheva as the infanticidal lead. Charles Castronovo, a fine tenor not seen here since 2009’s “Faust” will sing Jason, alongside Iain Paterson’s Créon. 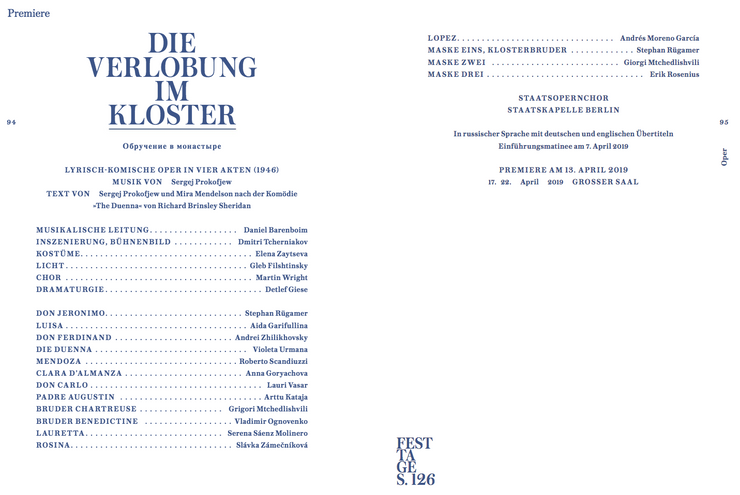 Two of the Staatsoper’s finest ensemble singers, Elsa Dreisig and Marina Prudenskaya will round of the cast. Austrian director Andrea Breth’s productions at the house have veered between revelatory (“Wozzeck” and “Jakob Lenz”) and insufferable (“Lulu,” “Katja Kabanova”). At least she’ll be at home with the dark subject matter. Up next is the Rameau, in what promises to be a danced-heavy production from the acclaimed British choreographer Aletta Collins. Sir Simon Rattle doesn’t seem like the obvious choice for this music, which will be entrusted to the distinguished Freiburger Barockorchester. As often is the case during the maestro’s appearances at the house, his wife, the sublime Czech mezzo Magdalena Kozena will be onstage, surrounded by an ensemble singer-heavy cast, including Ms. Dreisig, Anna Prohaska, Roman Trekel, Gyula Orendt and Roman Trekel. Beat Furrer’s “Violetter Schnee,” the first of two world premieres to be seen at the house next season, arrives in mid-January. 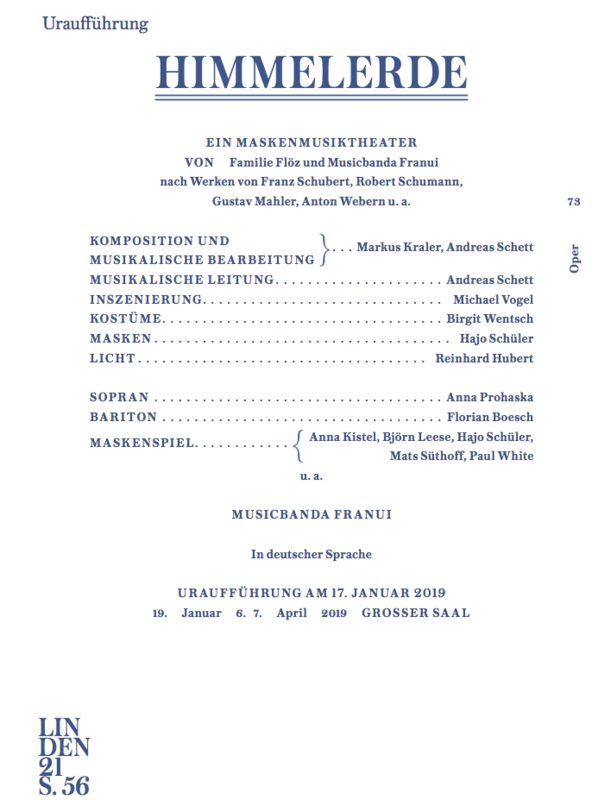 Based on motifs by the popular Russian writer Vladimir Sorokin, the Austrian composer’s work is reportedly the result of a close collaboration with both librettist Händl Klaus and stage director Claus Guth (one of the Staatsoper’s favorites of the moment). 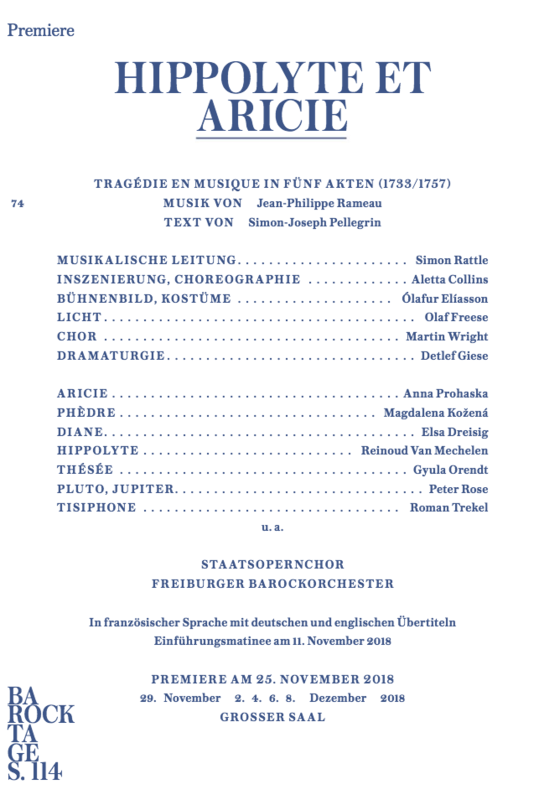 The same core of ensemble singers (Dreisig, Prohaska, Orendt) from the Rameau are joined by guests Georg Nigl, Tómas Tómasson and the actress Martina Gedeck (“The Tin Drum”, “The Lives of Others”). 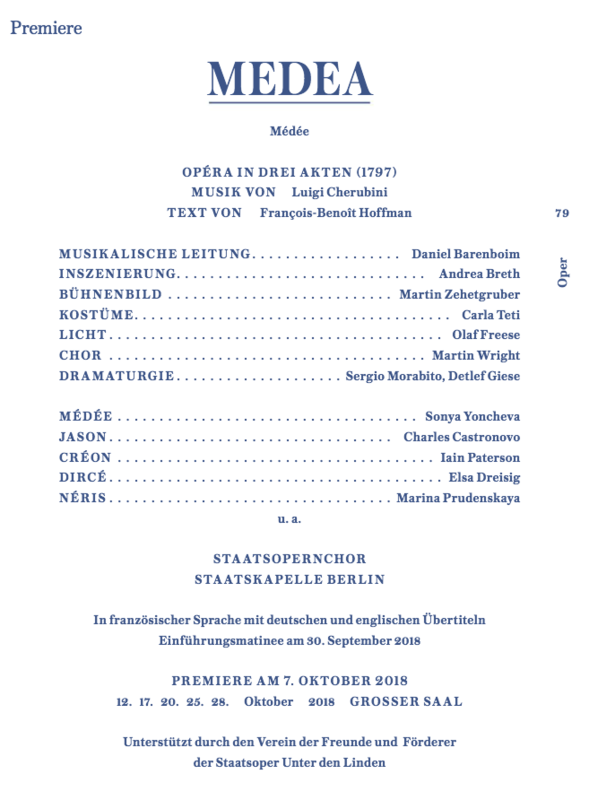 In an unexpected move, February’s premiere of “Die Zauberflöte” from American director Yuval Sharon (who’s on board for this year’s “Lohengrin” at Bayreuth) will not replace the company’s classic August Everding reconstruction of K.F. Schinkel’s 1816 production. Instead, the company will continue to present both stagings in repertory, a strategy I’ve only ever seen deployed at the Verona Opera Festival, where Franco Zeffirelli’s opulent “Aida” alternates with Fura dels Baus’ dazzling contemporary version. 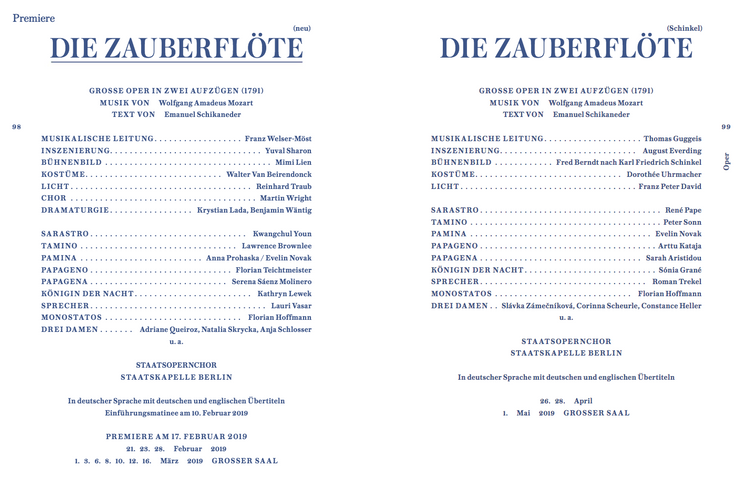 Both of the Staatsoper’s “Zauberflöten” boast fine casts, with the Viennese perfectionist Franz Welser-Möst conducting the new production premiere. At long last, Jörg Widmann’s epic “Babylon” arrives at the Lindenoper. 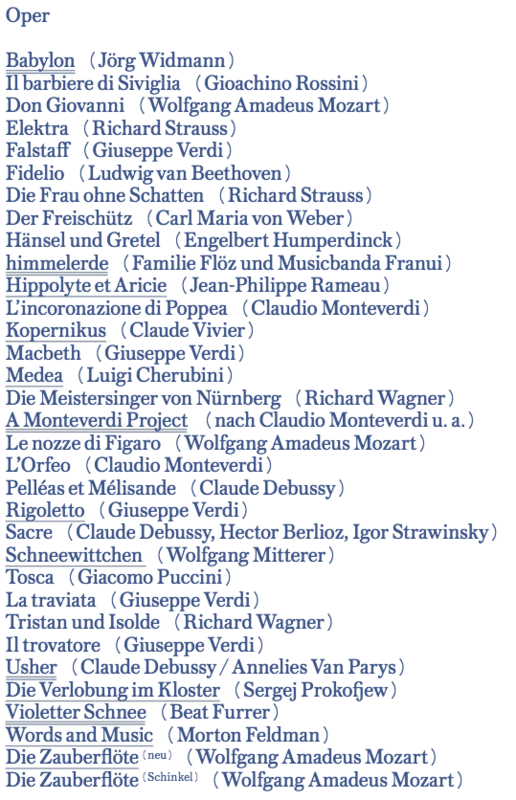 The revised version, which apparently wasn’t ready in time for this year’s disappointing reopening gala, will be in Barenboim’s fearless hands. The cast is entirely different from 2012, when the work premiered in Munich. Andreas Kriegenburg, the former intendant of the Deutsches Theater best known in the opera world for his Munich “Ring” cycle, directs. 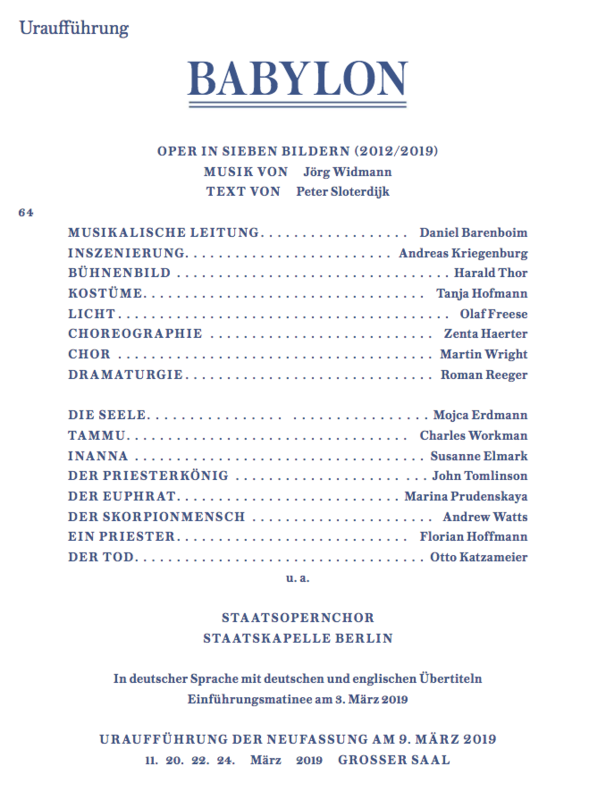 After his 2015 “Parsifal,” Dmitri Tcherniakov will again open the Staatsoper’s annual Easter Festival Days. After “The Gambler” (2006) and “The Tsar’s Bride” (2013), Tcherniakov returns to the Russian repertoire with Prokofiev’s little-seen “lyric-comic” opera (read: opera buffo) “Betrothal in a Monastery.” Once again, Barenboim is up at bat. Which leaves the disappointing news of the Barlett Sher transplant of “Rigoletto.” The spirited conducting of Colombian maestro Andrés Orozco-Estrada and the trio of Christopher Maltman, Nadine Sierra and Michael Fabiano should be greater incentives that the schlocky 1950s Vegas setting.